Born in October 1982 as the first daughter of the musical Lacherstorfer family in Bad Hall. Her dad Franz, hurdy-gurdyist, bagpiper, teacher, and avid collector of musical instruments, and Elfriede, a teacher and hobby-bassist, provided the piano their daughter used for her very first musical experience at the age of 6. The process of developing her musical skills included studying the violin, cello, harp, voice and dance/rhythmics in the local musicschool as well as many musicworkshops that were visited in summer. 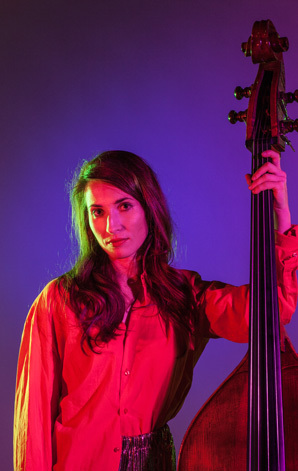 Eventually, somewhat haphazardly, she came to play the electric bass, and later the double bass. Together with her parents, her grandparents and her sister Julia she has been playing music all along. Her father’s huge collection of records, features loads of classical music as well as rock and pop music, that might have influenced Marlenes interest in various musical genres. After taking her A levels at the Linz HBLA art school in 2002, Marlene engaged in several social projects in Costa Rica and Panama before she made Vienna her new home town. Inspired by playing music in Panama City with musicians from Latin America, the desire to become a musician evolved. At the Vienna University of Music and Performing Arts, Marlene studied Music and Movement/ Eurhythmics as well as Popular Music (Electric bass and Double bass) and delved into traditional Austrian music and Classical piano. She graduated with one Master of arts (2016) and a bachelor of art degrees (2010). 2003 she started playing the electric bass in the independent-band VELOJET, where she developed her love for the lower register. Since then she has been constantly working with ensembles of various genres as electric or doubebassist, travelling to various countries, getting to know other music, people and cultures. Marlene loves performing on stage, touching and inspiring the audience. She frequently plays in various bands of the Vienna music scene such as ALMA, Ernst Molden&Willi Resetarits, ZOE, Meena Cryle, Juanita (Willi Resetarits and his daughter Johanna), Trouble Over Tokyo, Prinzessin Himbeere, Bernhard Eder, SoulHSistas, Esmeraldas Taxi, Robert Rotifer, Family Kuti Band, Ian Fisher, Aasgeiger or Gerry Höller. With some oft he bands she has played concert tours all over Europe as well as in Russia and the USA. Occasionally she works as a studio musician, e.g., for Wolfgang Ambros, Papermoon, ZOE or Gerard. Since 2016 Marlene i spart of german singer CLUESOs Liveband, whose Album „Neuanfang“ reached the top of Germany´s Popcharts. Since her graduation Marlene mainly works as a musician, appearing on about 1500 concerts in over 20 countries on 3 continents so far. But she didn´t forgot about her pedagogical side so far: Marlene has been working as a private teacher as as well as in various music schools, before she moved to the Vienna „University of Music and Performing Arts“. There she is teaching improvisation and inclusive music. She has been leading the band “ALL STARS INCLUSIVE” for 7 years, where musicstudents and people with disabilities make music together. This project was awarded the Diversitas Preis by the Federal Ministry of Science, Research and Economics in 2016 (special price). She is occasionally conducting workshops of different musical fields like rhythm-work, traditional music or forming a band.